From 1969 to 1970 Gary Donohoo served in the United States Navy aboard the USS Oriskany (CVA 34), one of the few Essex-class aircraft carriers completed after World War II, as part of the Vietnam War. Upon discharge, he worked for Laclede Steelworks in East Alton and was a deckhand on Motor Vessel Albert M on the Illinois River. As a continuation of his service and duty to country, in 1989 Gary reenlisted in the US Navy Reserves and in support of Desert Storm, he returned to the Philippines in 1990 and ‘91. After his service in Viet Nam, Gary decided to follow in his brother Kenny’s footsteps, who had built a barber business in Pittsfield, and went to barber school. Upon completion of his training in December 1972 he worked for Clem Anders in Anders Barbershop in Winchester until July 1975. From July 1975 until March 1976 Gary worked as a barber in The Men’s Room at Fairhills Mall in Springfield. At that time, Gary had the opportunity to purchase a barbershop and go into business for himself. An interesting side note: Gary’s nephew Roger now owns the Anders Barbershop in Winchester where Gary got his start and Roger also bought his father’s barbershop in Pittsfield. Roger will be opening a third location in late December in Mt. Sterling. On April 1, 1976, Gary began his career as the sole proprietor of The Loop Barbershop at 203 West Morgan, just off the southwest corner of the downtown square in Jacksonville. He purchased The Loop Barbershop from Jim Parker and Bill Fairfield. Mr. Donohoo is currently in his 46th year in the barber trade with 42 years as the proprietor of The Loop Barbershop. “I consider all my customers my friends. Jacksonville has been very good to me and my family” remarked Gary. Gary’s life has not always been about cutting hair. There are four hobbies that Gary has been involved with for a good part of his life. When he was about 14 to 15 years of age, he started developing a love for music and since 1971 has played in various bands in the Jacksonville area. 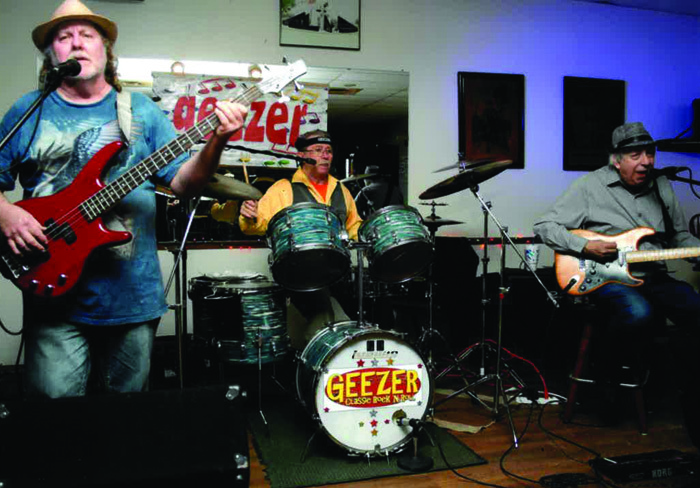 In 2011 Gary teamed up with Joe Tobin, Stan Robinson, and Roy Mathy to form the group Geezer, a band that features classic rock ‘n roll from the 60s, 70s, and 80s. Gary plays the drums and is on vocals with the group. Currently Stan still plays with the group on guitar and vocals and Roy is on bass and, also provides vocals. Geezer plays at many local bars and area events and is available for birthday parties, retirement parties, wedding receptions, and hometown celebrations. Donohoo added “We play the good stuff! Give us a call. We don’t consider ourselves old, we are vintage.” For booking Geezer, you can contact Gary at 217- 602-1785 or Stan at 245-5352. This past October, Geezer had the opportunity to perform on Spirit of Peoria. One of the highlights for the group has been producing their first CD in 2016. They produced this project at Frequency Studios in Springfield. The name of their CD is “Rockin’, Rollin’ and Strollin’” and features their version of popular cover tunes from the 60s, 70s, and 80s. The band is currently working on their next CD. When not cutting hair or playing the drums for Geezer, Gary and his wife Sharon, his bride of 47 years, have enjoyed motorcycle riding together as well as spending time with their two sons, their wives and two grandsons. “Thank goodness the boys took after their mother and not me,” jokes Donohoo. The Loop Barbershop is open Tuesday, Wednesday, and Thursday from 9:00 a.m. until 4:30 p.m. Tuesdays are for walk-ins and Wednesday and Thursday are by appointment.